Herbert Howells was born in Lydney, Gloucester on 17 October 1892. He showed a keen interest in composition early in his life and, at the age of eighteen, became a pupil of Herbert Brewer, Organist of Gloucester Cathedral. In 1912 he was awarded a scholarship to the Royal College of Music and studied under Charles Villiers Stanford, Walter Parratt, Charles Wood and Hubert Parry. Unlike his close friend and mentor, Ralph Vaughan Williams, Howells never collected or made direct use of folk songs. He did, however, accept their importance as part of a wider musical heritage but preferred to allow church modes and the pentatonic scale to play a more prominent part in the construction of his output. The move away from secular to sacred music after Hymus Paradisi (1938) continued into the 1940s with a series of compositions setting Mass texts and Canticles, most notably the Magnificat and Nunc Dimittis from the Anglican Evensong service. 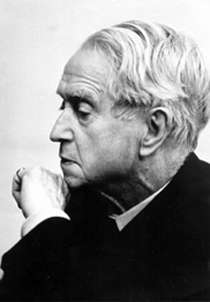 Herbert Howells died in London on 23 February 1983 at the age of 90. During his life he has been awarded a Collard Life Fellowship (Worshipful Company of Musicians), CBE (1953) and in 1972 was made a Companion of Honour.